1Hover your mouse over the Business Services link on the right side of the top navigation bar, and then click Advertise from the drop-down list that appears. 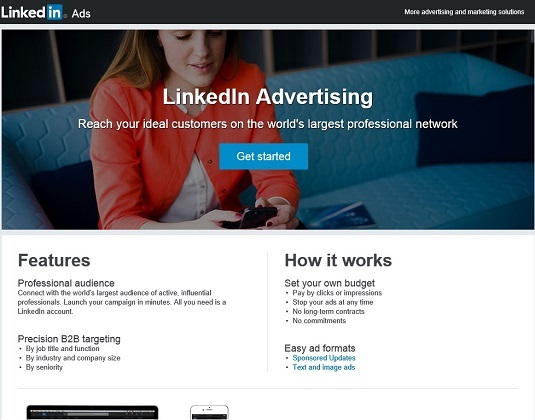 You are taken to LinkedIn’s advertising start page, which describes the features and operation of the different ads available. 2Click the Get Started button in the middle of the page. 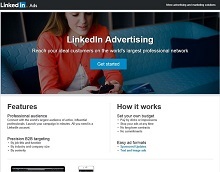 LinkedIn takes you to its Campaign Manager start page, where you can choose between a Text ad and a Sponsored Update. 3Click the Select button next to the ad type you want to create. For this example, you will be creating a Text ad. 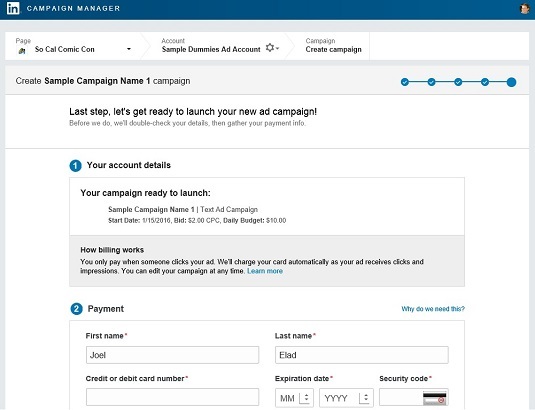 The first time you click either ad product, LinkedIn takes you to an Ad Account creation page, where you define your ad account name, select your currency, and specify if you have a Company or Showcase page to tie to your account. 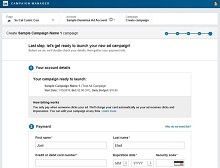 Once you’ve provided that information, you click the Next button to start building your campaign. 4Define a campaign name and, for first-time users, define the language to be used for your campaign. You can use up to 50 characters to define the name of your campaign, so try to create a name that’ll summarize the goals or target audience of your ad campaign. 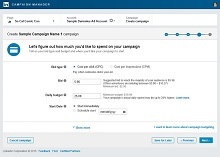 Try to add some detail in the name in case you run multiple campaigns to test the effectiveness of your message (for example, Sample Campaign A, B, C, and so on). Enter the name into the box provided and then click the Next button to proceed. 5Define the headline, copy, image, and destination URL of your ad, while seeing a preview of your potential ad as you write it. 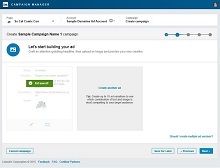 You’re taken to the Build Ad page within the LinkedIn Campaign Manager, where you define the meat of your ad, starting with the destination URL. Decide whether the ad will take people to your LinkedIn page (and then define which specific page, like a Company page), or an external website. Define the exact URL in the my website box provided. 6Enter the headline of your ad and the message “copy” in the boxes provided. You are limited to a 25-character headline and a 75-character message for your ad, so choose your words carefully. If you are going to provide an image with your ad, click the pencil icon at the bottom of the sample image provided to load the image from your computer onto LinkedIn. As you design your ad, along the right side of the screen you see a preview of the finished product. You can choose different formats for your ad, like Square, Tall, Horizontal, or Long, if you are designing a Text ad. 7Once you’ve defined everything and picked your ideal format, click the Save button at the bottom right of the screen to proceed. If you are unsure about whether the content of your ad will be allowed, read more about LinkedIn’s ad guidelines. 8Make variations of your ad to test out the effectiveness of different text messages and/or images. LinkedIn offers you the ability to create up to 15 variations of the same ad so you can see which combination of text and image is the most effective in gaining attention. Simply click the Create Another Ad link in the middle of the page and repeat Step 5. Click the Next button when you are satisfied with the number of ad variations for this campaign. 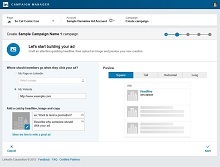 9Use the targeting filters to come up with your ideal target audience for your ad. LinkedIn allows you to target potential ad viewers using the information LinkedIn has for their account. You can target based on location, job title, company name/size, and other elements like field of study, skills, degrees, group affiliations, or demographic information like their gender or age. Simply click the particular criteria to set the desired value. As you add filters, your potential audience number will update along the right side of the screen. Repeat the process until you’ve defined all your criteria, and then click the Next button to proceed. 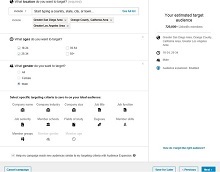 Currently, a location filter is required; you can only target up to 10 regions, sub-regions, or countries; and your ad must be able to target at least 1,000 potential viewers, so you can’t use too many precise filters. 10Determine your bid type, bid amount, daily budget, and start date for your campaign. 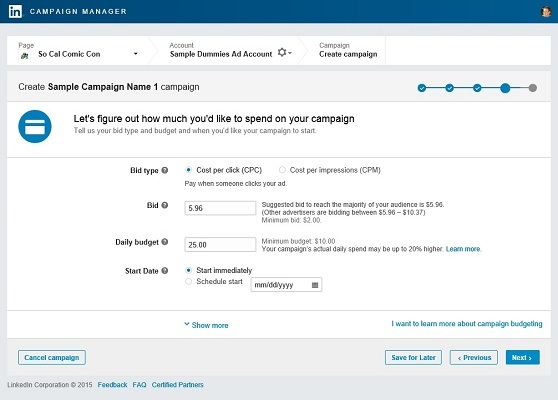 Once you’ve defined your ad and your targeting filters, LinkedIn will prompt you to set your spending limits for this campaign. You can decide between cost per click (CPC) and cost per impressions (CPM). Based on that decision, you can set the bid amount and daily budget amount. As for start date, you can choose for the campaign to start immediately after being approved, or set a start date in the future. If you click the Show More link, you can pick an end date for your campaign as well. Click the Next button when you’re ready to proceed. Currently, you must assign a minimum CPC bid of $2 per click and a minimum daily budget of $10. 11Provide a valid credit card for LinkedIn to bill when your ad campaign is live. LinkedIn provides you with a summary and asks you to enter a valid credit card into the prompts provided on the page so it can bill your card after people start clicking your ad or LinkedIn displays your ad with enough impressions to incur a charge on your ad campaign. After you enter your payment method, scroll down and click the Review Order button so LinkedIn can store that payment information. 12Scroll down and click the yellow Launch Campaign button to start your ad campaign. That’s it! LinkedIn needs to manually review your ad to make sure you are complying with its ad guidelines, but that process usually takes an average of 12 hours or less, depending on what day and time the campaign was submitted to LinkedIn. Once the ad is approved and running, LinkedIn will send you a notification.